This is a list of gases at standard conditions This means the substance boils at or below 25 °C at 1 atmosphere pressure and is reasonably stable. "triple" means that is a triple point, and that the substance sublimes at one atmosphere pressure. The following list has substances known to be gases, but with an unknown boiling point. Difluorodioxirane boils between −80 and −90°. This list includes substances that may be gases. However reliable references are not available. This list includes substances that boil just above standard condition temperatures. Numbers are boiling temperatures in °C. Gallium(III) hydride liquid decomposes at 0°C. Nitroxyl is unstable and short lived. Sulfur pentafluoride isocyanide isomerises to sulfur pentafluoride cyanide. Haynes, W. M., ed. (2016). CRC Handbook of Chemistry and Physics (96th ed.). Boca Raton, Florida: CRC Press/Taylor and Francis. pp. 3–4–4–101. ^ a b c d e f g h i j k l m n o p q r s t u v w x y z aa ab ac ad ae af ag ah ai aj ak al am an ao ap aq ar as at au av aw ax ay az ba bb bc bd be bf Yaws, Carl L. (2015). The Yaws Handbook of Physical Properties for Hydrocarbons and Chemicals: Physical Properties for More Than 54,000 Organic and Inorganic Chemical Compounds, Coverage for C1 to C100 Organics and Ac to Zr Inorganics. Gulf Professional Publishing. p. 3. ISBN 9780128011461. ^ DesMarteau, Darryl D. (January 1972). "Fluoroperoxytrifluoromethane, CF3OOF. Preparation from trifluoromethyl hydroperoxide and fluorine in the presence of cesium fluoride". Inorganic Chemistry. 11 (1): 193–195. doi:10.1021/ic50107a047. ^ Downs, A. J. (1962). "846. Thiocarbonyl fluoride". Journal of the Chemical Society (Resumed): 4361. doi:10.1039/JR9620004361. ^ Meyers, M. D.; Frank, S. (August 1966). "Difluorocyanamide". Inorganic Chemistry. 5 (8): 1455–1457. doi:10.1021/ic50042a040. ^ Shreeve, Jean'ne M.; Duncan, Leonard Clinton; Cady, George H. (October 1965). "Difluoroaminooxyperfluoromethane, CF3ONF2". Inorganic Chemistry. 4 (10): 1516–1517. doi:10.1021/ic50032a045. ^ a b c Stephenson, Richard Montgomery (2012). Handbook of the Thermodynamics of Organic Compounds. Springer Science & Business Media. p. 7. ISBN 9789400931732. ^ Fraser, George W.; Shreeve, Jean'ne M. (October 1965). "Difluoraminocarbonyl Fluoride". Inorganic Chemistry. 4 (10): 1497–1498. doi:10.1021/ic50032a034. ^ a b c Barr, D. A.; Haszeldine, R. N. (1956). "663. Perfluoroalkyl derivatives of nitrogen. Part III. Heptafluoronitrosopropane, perfluoro-2-n-propyl-1 : 2-oxazetidine, perfluoro-(methylene-n-propylamine), and related compounds". Journal of the Chemical Society (Resumed): 3416. doi:10.1039/JR9560003416. ^ Science of Synthesis: Houben-Weyl Methods of Molecular Transformations Vol. 18: Four Carbon-Heteroatom Bonds. Georg Thieme Verlag. 2014. p. 1147. ISBN 9783131719119. ^ Ruff, O.; Giese, M. (4 March 1936). "Die Fluorierung des Silbercyanids. (I.)". Berichte der Deutschen Chemischen Gesellschaft (A and B Series) (in German). 69 (3): 598–603. doi:10.1002/cber.19360690325. ^ Dininny, R. E.; Pace, E. L. (March 1960). "Thermodynamic Properties of Trifluoromethanethiol from 12°K to Its Boiling Point. Entropy from Molecular and Spectroscopic Data". The Journal of Chemical Physics. 32 (3): 805–809. doi:10.1063/1.1730801. ^ a b c Haszeldine, R. N. (1951). "22. Perfluoro-tert.-amines". Journal of the Chemical Society (Resumed). 0: 102. doi:10.1039/jr9510000102. ISSN 0368-1769. ^ Aymonino, P. J. (1965). "Trifluoromethyl fluoroformate". Chemical Communications (London) (12): 241. doi:10.1039/C19650000241. ^ a b Chambers, W. J.; Tullock, C. W.; Coffman, D. D. (June 1962). "The Synthesis and Chemistry of Fluoroazoalkanes". Journal of the American Chemical Society. 84 (12): 2337–2343. doi:10.1021/ja00871a014. ^ HAUPTFLEISCH, John O. (2009). "SYNTHESIS OF TRIFLUORONITROMETHANE, CF3NO2: PHOTOCHEMICAL SCALE-UP AND A NEW THERMOGENERATION METHOD WITH A REFINED PURIFICATION TECHNIQUE" (PDF). University of Alabama. p. 28. ^ Dresdner, R. D; Merritt, Jack; Royal, Joyce P. (August 1965). "Photochemical Fluorinations of C2N2 and RfN=-SF2 with N2F4". Inorganic Chemistry. 4 (8): 1228–1230. doi:10.1021/ic50030a033. ^ Bohon, Robert L. (1 December 1969). "Separation of Tris(difluoroamino)fluoromethane and Bis(difluoroamino)fluoromethane with Crystalline Zeolites". Industrial & Engineering Chemistry Product Research and Development. 8 (4): 443–445. doi:10.1021/i360032a024. ^ Blackley, W. D.; Reinhard, R. R. (February 1965). "A New Stable Radical, Bis(trifluoromethyl) Nitroxide". Journal of the American Chemical Society. 87 (4): 802–805. doi:10.1021/ja01082a019. ^ Lösking, Oliver; Willner, Helge (September 1989). "Sulfur Cyanide Pentafluoride SF5 CN". Angewandte Chemie International Edition in English. 28 (9): 1255–1256. doi:10.1002/anie.198912551. ^ a b Haynes, W. M. (2014). CRC Handbook of Chemistry and Physics 95ed. CRC Press. ISBN 97814822-08689. ^ Griffin, C. E.; Haszeldine, R. N. (1960). "279. Perfluoroalkyl derivatives of nitrogen. Part VIII. Trifluoronitrosoethylene and its polymers". Journal of the Chemical Society (Resumed): 1398. doi:10.1039/JR9600001398. ^ Haynes, W. M., ed. (2016). CRC Handbook of Chemistry and Physics (96th ed.). Boca Raton, Florida: CRC Press/Taylor and Francis. p. 6-70. ^ a b c Misani, Fernanda; Speers, Louise; Lyon, A. M. (June 1956). "Synthetic Studies in the Field of Fluorinated Cyclopropanes". Journal of the American Chemical Society. 78 (12): 2801–2804. doi:10.1021/ja01593a041. ^ Logothetis, A. L.; Sausen, G. N.; Shozda, R. J. (February 1963). "The Preparation of Difluoroamino Sulfur Pentafluoride". Inorganic Chemistry. 2 (1): 173–175. doi:10.1021/ic50005a044. ^ a b c d e f Miller, William T.; Fried, John H.; Goldwhite, Harold (June 1960). "Substitution and Addition Reactions of the Fluoroölefins. IV. Reactions of Fluoride Ion with Fluoroölefins". Journal of the American Chemical Society. 82 (12): 3091–3099. doi:10.1021/ja01497a028. ^ a b Frazer, J.W. (November 1960). "Preparation of N,N-difluoromethylamine and N,N-difluoroethylamine". Journal of Inorganic and Nuclear Chemistry. 16 (1–2): 63–66. doi:10.1016/0022-1902(60)80088-7. ^ a b Griffiths, S.T. ; Wilson, R.R. (September 1958). "The spontaneous ignition of alkyl silanes". Combustion and Flame. 2 (3): 244–252. doi:10.1016/0010-2180(58)90045-2. ^ Duncan, Leonard C.; Cady, George H. (June 1964). "The Preparation and Properties of Trifluoromethoxy Sulfur Pentafluoride [CF3OSF5] and cis-Bis(trifluoromethoxy)tetrafluorosulfur(VI) [(CF3 O)2SF4 ]". Inorganic Chemistry. 3 (6): 850–852. doi:10.1021/ic50016a015. ^ a b c Gould, Douglas E.; Anderson, Lowell Ray; Young, David Edward; Fox, William B. (March 1969). "Perhaloalkyl hypochlorites and pentafluorosulfur hypochlorite. I. Preparation and properties". Journal of the American Chemical Society. 91 (6): 1310–1313. doi:10.1021/ja01034a008. ^ a b De Marco, Ronald A.; Fox, W. B. (September 1982). "(Trifluoroacetyl)sulfur pentafluoride". The Journal of Organic Chemistry. 47 (19): 3772–3773. doi:10.1021/jo00140a039. ^ Anderson, Lowell Ray; Fox, William B. (September 1970). "New preparation for trifluoromethyl fluoroformyl peroxide and bis(trifluoromethyl) trioxide". Inorganic Chemistry. 9 (9): 2182–2183. doi:10.1021/ic50091a045. ^ a b c d Ang, H. G.; Syn, Y. C. (1974). Advances in Inorganic Chemistry and Radiochemistry. Academic Press. ISBN 9780080578651. ^ Emeléus, H. J.; Heal, H. G. (1949). "363. The ethoxyfluorosilanes". J. Chem. Soc. 0: 1696–1699. doi:10.1039/JR9490001696. ^ a b c d e Burns, T. H. S.; Bracken, A. (1972). "Exploratory and Newer Compounds". Modern Inhalation Anesthetics. Springer Berlin Heidelberg. pp. 418–439. doi:10.1007/978-3-642-65055-0_19. ISBN 9783642650574. ^ a b Smith, William C.; Tullock, Charles W.; Smith, Ronald D.; Engelhardt, Vaughn A. (February 1960). "Chemistry of Sulfur Tetrafluoride. III. Organoiminosulfur Difluorides". Journal of the American Chemical Society. 82 (3): 551–555. doi:10.1021/ja01488a013. ^ Emeléus, H. J.; Wilkins, C. J. (1944). "122. Some new ethyl and phenyl silicon fluorides". J. Chem. Soc. 0: 454–456. doi:10.1039/JR9440000454. ^ H. G. Ang; Y. C. Syn (1974). "The chemistry of bis(trifluoromethyl)amine compounds". Advances in Inorganic Chemistry and Radiochemistry. Academic Press. p. 29. ISBN 9780080578651. ^ a b c Hauptschein, Murray; Nodiff, Edward A.; Grosse, Aristid V. (March 1952). "Perfluoroalkyl Halides Prepared from Silver Perfluoro-fatty Acid Salts. II. Perfluoroalkyl Bromides and Chlorides". Journal of the American Chemical Society. 74 (5): 1347–1350. doi:10.1021/ja01125a511. ^ a b c Macintyre, Jane E. (1994). Dictionary of Inorganic Compounds, Supplement 2. CRC Press. p. 25. ISBN 9780412491009. ^ Davis, Ralph Anderson; Kroon, James L.; Rausch, Douglas A. (May 1967). "Pentafluoroguanidine". The Journal of Organic Chemistry. 32 (5): 1662–1663. doi:10.1021/jo01280a103. ^ "1,1,2,2-Tetrafluoropropane | C3H4F4 | ChemSpider". www.chemspider.com. ^ a b c Macintyre, Jane E. (1994). Dictionary of Inorganic Compounds, Supplement 2. CRC Press. ISBN 9780412491009. ^ Young, D.E. ; Anderson, L.R. ; Gould, D.E. ; Fox, W.B. (January 1969). "Perfluoroalkyl chloroformates and chlorosulfates". Tetrahedron Letters. 10 (9): 723–726. doi:10.1016/S0040-4039(01)87792-3. ^ Burns, T. H. S.; Bracken, A. (1972). "Exploratory and Newer Compounds". Modern Inhalation Anesthetics. Springer Berlin Heidelberg. p. 413. doi:10.1007/978-3-642-65055-0_19. ISBN 9783642650574. ^ a b c De Pasquale, Ralph J.; Padgett, Calvin D.; Patton, Jerry R. (May 1973). "PERFLUOROCARBON EPOXIDES Part I TECHNICAL REPORT AFML-TR-73-144" (PDF). PCR, Inc.
^ a b c Tullock, C. W.; Coffman, D. D.; Muetterties, E. L. (February 1964). "Synthesis and Chemistry of SF5Cl". Journal of the American Chemical Society. 86 (3): 357–361. doi:10.1021/ja01057a013. ^ Burg, Anton B.; Mahler, Walter (August 1957). "A NEW SYNTHESIS OF BIS-TRIFLUOROMETHYL-PHOSPHINE, (CF3) PH". Journal of the American Chemical Society. 79 (15): 4242. doi:10.1021/ja01572a072. ^ "1,1,4,4-Tetrafluoro-1,3-butadiene | C4H2F4 | ChemSpider". www.chemspider.com. ^ Schmuck, Arno; Seppelt, Konrad (February 1987). "Sulfur Pentafluoride Cyanate, F5S-O-C≡N". Angewandte Chemie International Edition in English. 26 (2): 134–135. doi:10.1002/anie.198701341. ^ a b c Demiel, Arye (July 1965). "Structure and Stability of the Bromofluoroethylenes. II. The Geometric Isomers of 1-Bromo-1,2-difluoro- and 1,2-Dibromo-1,2-difluoroethylene". The Journal of Organic Chemistry. 30 (7): 2121–2126. doi:10.1021/jo01018a002. ^ Advances in Organometallic Chemistry. Academic Press. 1964. p. 154. ISBN 9780080580029. ^ Parsons, Theran D.; Baker, Everett D.; Burg, Anton B.; Juvinall, Gordon L. (January 1961). "A TRIFLUOROMETHYLBORON COMPOUND, CF3BF2". Journal of the American Chemical Society. 83 (1): 250–251. doi:10.1021/ja01462a053. ^ Jander, J.; Haszeldine, R. N. (1954). "Addition of free radicals to unsaturated systems. Part VI. Free-radical addition to the nitroso-group". Journal of the Chemical Society (Resumed): 696. doi:10.1039/JR9540000696. ^ Houben-Weyl Methods of Organic Chemistry Vol. E 10b/2, 4th Edition Supplement: Organo-Fluorine Compounds - Synthesis of Fluorinated Compounds II, Transformations of Fluorinated Compounds. Georg Thieme Verlag. 2014. p. 23. ISBN 9783131815644. ^ O'Neill, Gerald J. (20 October 1977). "Stabilization of methyl trifluorovinyl ether US Patent 4127613". ^ Talbott, Richard L. (May 1968). "Fluorocarbon peroxides. 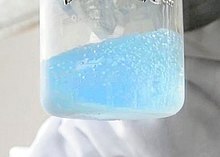 Novel peroxides prepared from bis(fluoroformyl) peroxide". The Journal of Organic Chemistry. 33 (5): 2095–2099. doi:10.1021/jo01269a084. ^ a b Toropov, Andrey; Toropova, Alla (December 2004). "Nearest neighboring code and hydrogen bond index in labeled hydrogen-filled graph and graph of atomic orbitals: application to model of normal boiling points of haloalkanes". Journal of Molecular Structure: THEOCHEM. 711 (1–3): 173–183. doi:10.1016/j.theochem.2004.10.003. ^ "Pentafluoroethyl iodide | C2F5I". www.chemspider.com. ^ Gilman, Henry; Jones, R. G. (August 1943). "2,2,2-Trifluoroethylamine and 2,2,2-Trifluorodiazoethane". Journal of the American Chemical Society. 65 (8): 1458–1460. doi:10.1021/ja01248a005. ^ Yang, Zhi-qiang; Kou, Lian-gang; Mao, Wei; Lu, Jing; Zhang, Wei; Lu, Jian (20 December 2013). "Experimental Study of Saturated Pressure Measurements for 2,3,3,3-Tetrafluoropropene (HFO-1234yf) and 2-Chloro-1,1,1,2-Tetrafluoropropane (HCFC-244bb)". Journal of Chemical & Engineering Data. 59 (1): 157–160. doi:10.1021/je400970y. ^ Hoffmann, Friedrich W.; Simmons, Thomas C.; Beck, R. B.; Holler, H. V.; Katz, T.; Koshar, R. J.; Larsen, E. R.; Mulvaney, J. E.; Rogers, F. E.; Singleton, B.; Sparks, R. S. (July 1957). "Fluorocarbon Derivatives. I. Derivatives of Sulfur Hexafluoride". Journal of the American Chemical Society. 79 (13): 3424–3429. doi:10.1021/ja01570a029. ^ Sekiya, Akira; DesMarteau, Darryl D. (May 1980). "Synthesis and properties of 2-(pentafluorothio)-3,3-difluorooxaziridine". Inorganic Chemistry. 19 (5): 1330–1333. doi:10.1021/ic50207a045. ^ Arvia, A. J.; Aymonino, P. J.; Waldow, C. H.; Schumacher, H. J. (7 March 1960). "Bis-monofluorcarbonyl-peroxyd". Angewandte Chemie. 72 (5): 169. doi:10.1002/ange.19600720505. ^ Knunyants, I. L.; Yakobson, G. G. (2012). Syntheses of Fluoroorganic Compounds. Springer Science & Business Media. ISBN 9783642702075. ^ "trifluorbutane | C4H7F3 | ChemSpider". www.chemspider.com. ^ Case, J. R.; Ray, N. H.; Roberts, H. L. (1961). "394. Sulphur chloride pentafluoride: reaction with fluoro-olefins". Journal of the Chemical Society (Resumed): 2070. doi:10.1039/JR9610002070. ^ Pernice, Holger; Willner, Helge; Bierbrauer, Karina; Burgos Paci, Maximiliano; Argüello, Gustavo A. (18 October 2002). [10.1002/1521-3773(20021018)41:20<3832::AID-ANIE3832>3.0.CO;2-M "Fluoroformic Acid Anhydride, FC(O)OC(O)F"] Check |url= value (help). Angewandte Chemie International Edition. 41 (20): 3832–3834. doi:10.1002/1521-3773(20021018)41:203.0.CO;2-M.
^ Middleton, William J. (November 1973). "Perfluorovinyl isocyanates". The Journal of Organic Chemistry. 38 (22): 3924–3928. doi:10.1021/jo00962a022. ^ "1-Chloro-1,1,2,2-tetrafluoropropane | C3H3ClF4 | ChemSpider". www.chemspider.com. ^ Clifford, A. F.; El-Shamy, H. K.; Emeléus, H. J.; Haszeldine, R. N. (1953). "483. Organometallic and organometalloidal fluorine compounds. Part VIII. The electrochemical fluorination of dimethyl sulphide and carbon disulphide". J. Chem. Soc. 0: 2372–2375. doi:10.1039/JR9530002372. ^ Kobayashi, Yoshiro; Yoshida, Tsutomu; Kumadaki, Itsumaro (January 1979). "Trifluoromethyl trifluoromethanesulfonate (CF3SO2OCF3)". Tetrahedron Letters. 20 (40): 3865–3866. doi:10.1016/S0040-4039(01)95545-5. ^ "1,2,2-Trifluoropropane | C3H5F3 | ChemSpider". www.chemspider.com. ^ Wold, Aaron; Ruff, John K. (2009). Inorganic Syntheses Volume 14. John Wiley & Sons. p. 45. ISBN 9780470132807. ^ "1,1,1,2,3-Pentafluoropropane | C3H3F5 | ChemSpider". www.chemspider.com. ^ a b Burdon, J.; Chivers, G. E.; Mooney, E. F.; Tatlow, J. C. (1969). "Partial fluorination of tetrahydrofuran with cobalt trifluoride". Journal of the Chemical Society C: Organic. 0 (13): 1739. doi:10.1039/j39690001739. ISSN 0022-4952. ^ Jones, E. R. H.; Eglinton, Geoffrey; Whiting, M. C.; Shaw, B. L. (1954). Ethoxyacetylene. Organic Syntheses. 34. p. 48. doi:10.1002/0471264180.os034.15. ISBN 978-0471264224. ^ Birchall, J. M.; Bloom, A. J.; Haszeldine, R. N.; Willis, C. J. (1962). "584. Perfluoroalkyl derivatives of nitrogen. Part X. The reaction of nitric oxide with tetrafluoroethylene, and formation of a nitrosopolymer". Journal of the Chemical Society (Resumed): 3021. doi:10.1039/JR9620003021. ^ Wagner, Ross I.; Freeman, LeVern D.; Goldwhite, H.; Rowsell, D. G. (March 1967). "Phosphiran". Journal of the American Chemical Society. 89 (5): 1102–1104. doi:10.1021/ja00981a013. ^ a b c Burns, T. H. S.; Bracken, A. (1972). "Exploratory and Newer Compounds". Modern Inhalation Anesthetics. Springer Berlin Heidelberg. pp. 416–417. doi:10.1007/978-3-642-65055-0_19. ISBN 9783642650574. ^ "2-Fluorobutane | C4H9F | ChemSpider". www.chemspider.com. ^ Thompson, Phillip Gerhard. (August 1967). "Bis(perfluoroalkyl) trioxides". Journal of the American Chemical Society. 89 (17): 4316–4319. doi:10.1021/ja00993a012. ^ Varetti, E. L.; Aymonino, P. J. (1967). "New photochemical routes to perfluoromethyl carbonate". Chemical Communications (London) (14): 680. doi:10.1039/C19670000680. ^ Russo, Antonio; DesMarteau, Darryl D. (June 1993). "Difluorodioxirane". Angewandte Chemie International Edition in English. 32 (6): 905–907. doi:10.1002/anie.199309051. ^ De Marco, Ronald A.; Shreeve, Jean'ne M. (May 2002). "Reactions of the fluorimide-potassium fluoride adduct HNF2.KF, with sulfinyl and perfluoroalkylsulfinyl fluorides. Preparation of perfluoroalkyl perfluoroalkylthiosulfonates". Inorganic Chemistry. 12 (8): 1896–1899. doi:10.1021/ic50126a040. ^ "1,1,2,3,4,4-Hexafluoro-1,3-butadiene | C4F6 | ChemSpider". www.chemspider.com. ^ Martin, E. L.; Sharkey, W. H. (October 1959). "1,1,4,4-Tetrafluoro-1,2,3-butatriene". Journal of the American Chemical Society. 81 (19): 5256–5258. doi:10.1021/ja01528a056. ^ Ehm, Christian; Lentz, Dieter (21 January 2011). "Cyclic dimers of tetrafluorobutatriene". Theoretical Chemistry Accounts. 129 (3–5): 507–515. doi:10.1007/s00214-011-0890-3. ^ "perfluoropent-1-ene | C5F10 | ChemSpider". www.chemspider.com. ^ Ulic, S. E.; von Ahsen, S.; Willner, H. (August 2004). "Photoisomerization of Matrix-Isolated Bis(trifluoromethyl) Sulfoxide: Formation of the Sulfenic Ester CF3SOCF3". Inorganic Chemistry. 43 (17): 5268–5274. doi:10.1021/ic049800r. ^ "Trifluoromethanesulfonyl chloride 164798". Sigma-Aldrich. ^ Thrasher, Joseph S.; Madappat, Krishnan V. (September 1989). "Sulfur-Pentafluoride Isocyanide, SF5NC". Angewandte Chemie International Edition in English. 28 (9): 1256–1258. doi:10.1002/anie.198912561.